Creating tiny yet beautiful documents and vignettes from R Markdown. The package provides the 'html_pretty' output format as an alternative to the 'html_document' and 'html_vignette' engines that convert R Markdown into HTML pages. 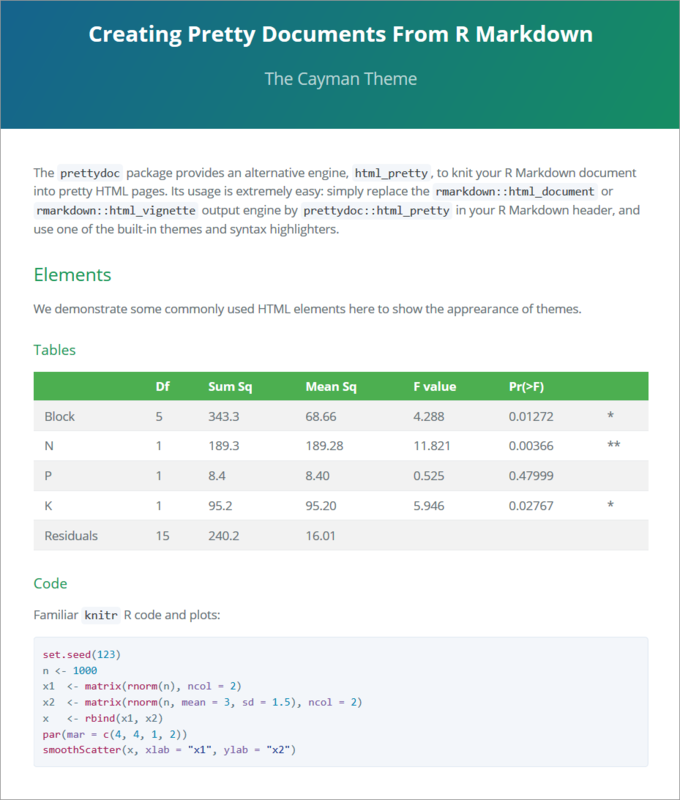 Various themes and syntax highlight styles are supported. 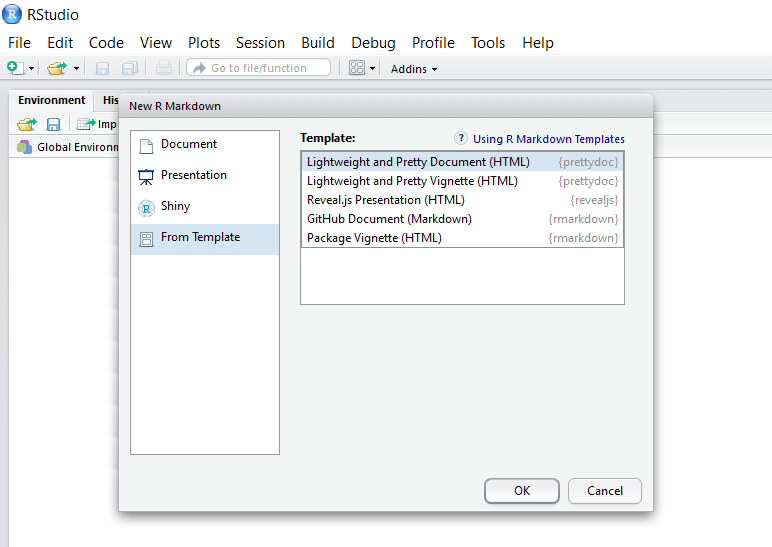 You can also create documents from prettydoc templates in RStudio. Step 1: Click the "New File" button and choose "R Markdown". Step 2: In the "From Template" tab, choose one of the built-in templates. Currently the theme option can take the following values. More themes will be added in the future. cayman: Modified from the Cayman theme. tactile: Modified from the Tactile theme. architect: Modified from the Architect theme. leonids: Modified from the Leonids theme. hpstr: Modified from the HPSTR theme. The highlight option takes value from github and vignette. Options code_folding, code_download and toc_float are not applicable. 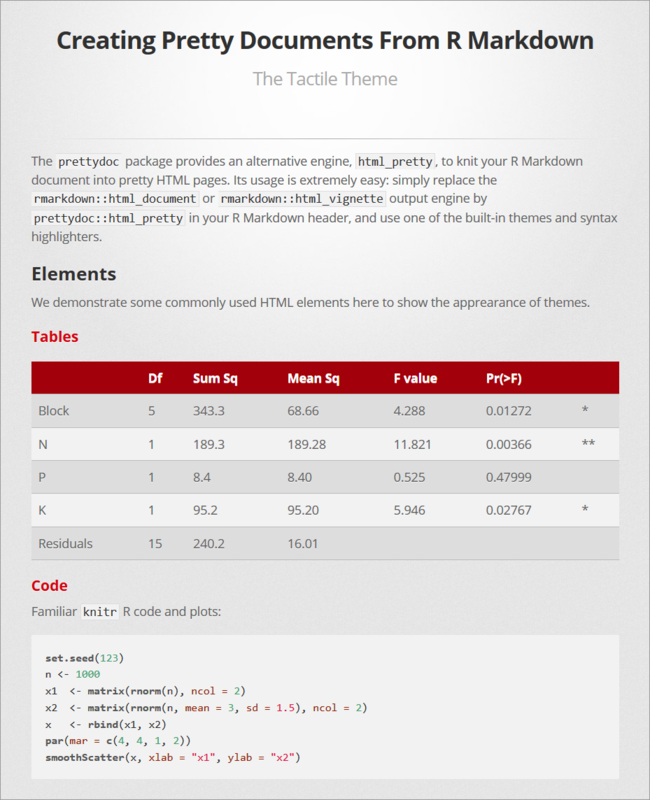 tufte provides the Tufte style for R Markdown documents. BiocStyle provides standard formatting styles for Bioconductor PDF and HTML documents. 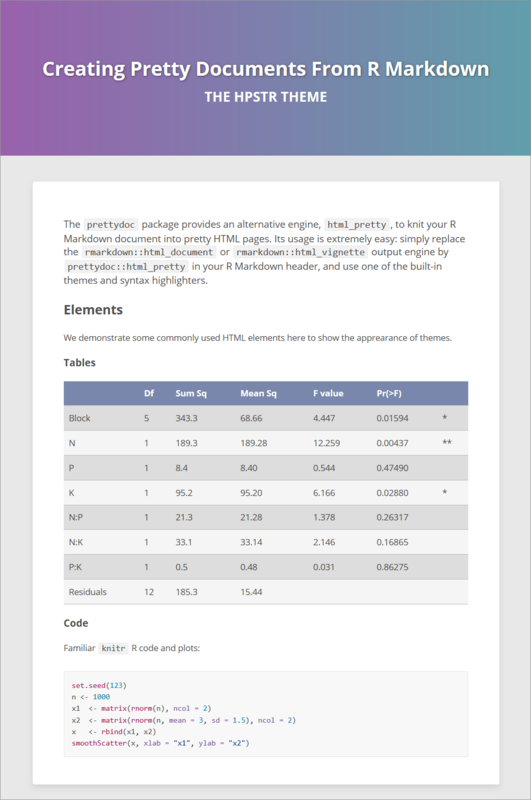 rmdformats by Julien Barnier contains HTML formats and templates for R Markdown documents, with some extra features such as automatic table of contents, lightboxed figures, and dynamic crosstab helper. 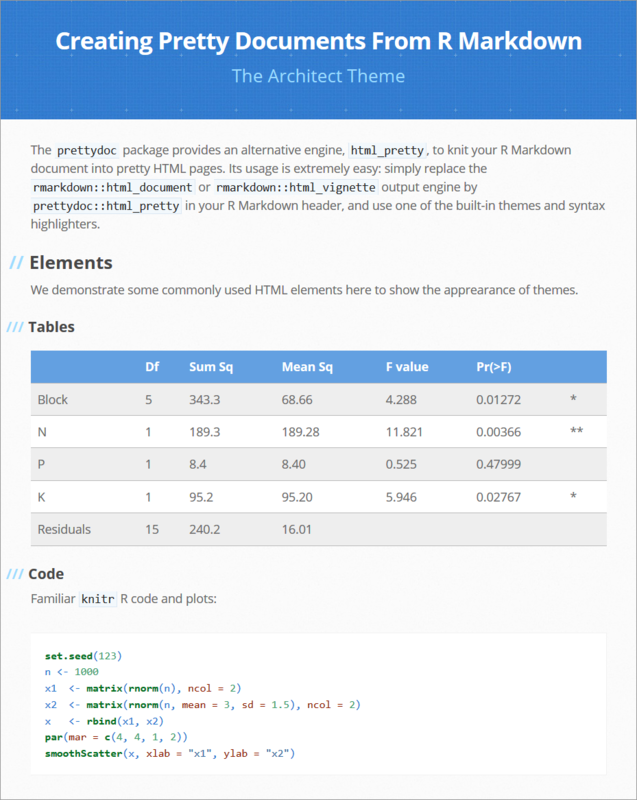 markdowntemplates by Bob Rudis is a collection of alternative R Markdown templates. 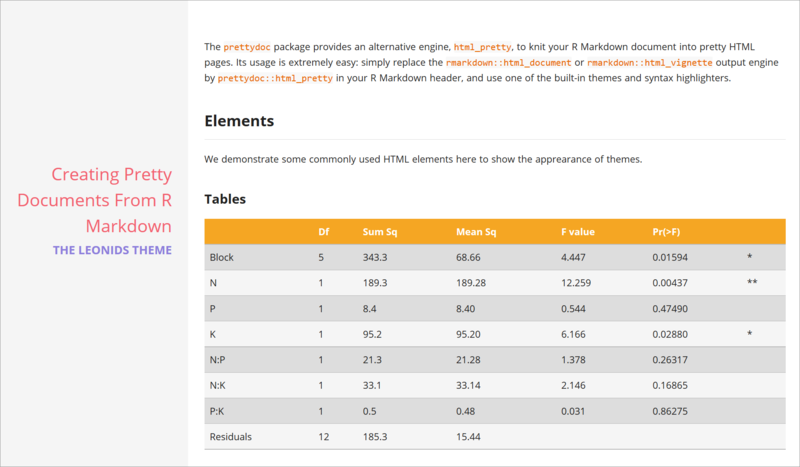 prettyjekyll by Florian Privé uses prettydoc to convert R Markdown documents to Jekyll Markdown for blog posting.